You guys, turmeric has my HEART these days! I keep finding myself putting it in everything, especially in quinoa. It’s so good for you, and it tastes amazing! Combine that turmeric quinoa with fresh kale, turmeric roasted potatoes, paprika roasted chickpeas, and a delicious avocado for the most epic Vegan Turmeric Quinoa Power Bowls! If you’ve never tried turmeric, this is the kind of turmeric that I personally use and love. It has a warm and peppery type of flavor and is also bright yellow (hellllloooo, natural food dye!). I was actually a little concerned after using this in my brand new bowls that I had permanently stained them, because it looked like I had taken a highlighter and marked all over them! No worries, though, it totally washes away 😉 Unless it gets on your clothes in which case……tye dye?? Just being positive over here, guys. Here’s how to make these Vegan Turmeric Quinoa Power Bowls in 30 minutes or less! No but for real, turmeric is legit, y’all. It’s a natural anti-inflammatory (and a powerful one, might I add) that also protects against a ton of diseases (6 Benefits Of Turmeric listed here) and is loaded with vitamins, minerals, and fiber! Heck-to-the-yes. I’ll take that! Not to mention, it makes these Vegan Turmeric Quinoa Power Bowls taste heavenly! Savory, creamy, wholesome, crunchy, warm, and spicy, to be exact. And my description is not even doing these bowls justice! This recipe makes 4 delicious bowls. If you don’t have 4 people to feed, they’re great for lunch leftovers! Feel free to add more turmeric if you’re feelin’ it! And on that note, be sure to add sea salt/pepper to your desired taste to the quinoa and roasted potatoes! Looking for other ways to add more turmeric to your meals? Try out the Golden Glow Pineapple Turmeric Smoothie and Turmeric Tahini & Roasted Beets Power Bowls recipes. 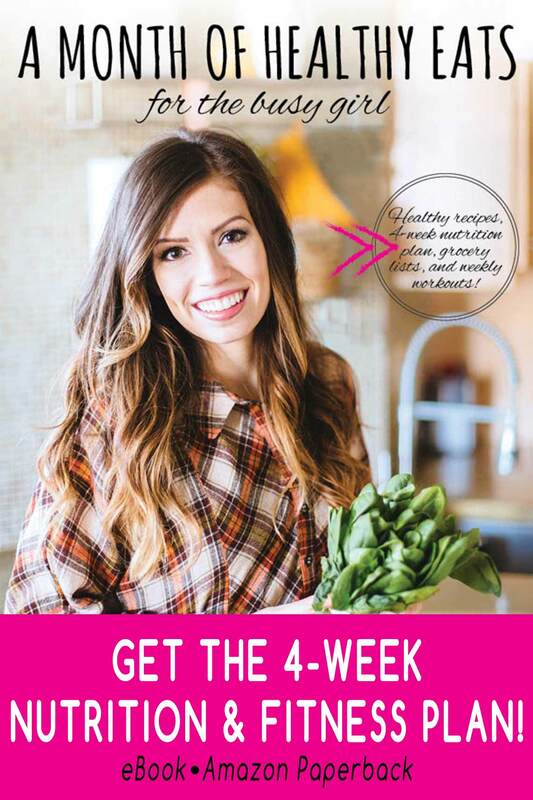 Also, be sure to check out my new book: A Month Of Healthy Eats For The Busy Girl! 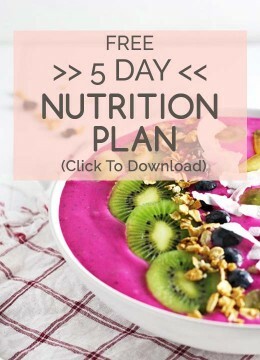 This 4-week nutrition and fitness plan includes tons of easy and healthy recipes, grocery lists, and a meal plan to make weekly meals easy and fun! Ok, let’s make some delicious Vegan Turmeric Quinoa Power Bowls! I keep finding myself putting it in everything, especially in quinoa. It's so good for you, and it tastes amazing! 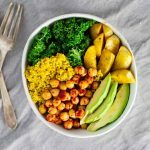 Combine that turmeric quinoa with fresh kale, turmeric roasted potatoes, paprika roasted chickpeas, and a delicious avocado for the most epic Vegan Turmeric Quinoa Power Bowls! Slice the potatoes into strips and lay flat on 1/2 of a baking sheet. Spray/drizzle them with coconut oil and sprinkle 1 tsp of turmeric over them. Add salt/pepper to taste. Roast for 5 minutes while you drain and rinse the chickpeas. Place the chickpeas in a mixing bowl and add 1 tsp of paprika, coating them evenly. Lay the chickpeas on the other 1/2 of the baking sheet. Roast the chickpeas and the potatoes for about 25 minutes (or until the potatoes are a little bit soft). Cook the quinoa with 1/2 cup of water. Once the quinoa is cooked, add 1 tsp of turmeric (salt/pepper to taste), mix together, and let cool. Wash the kale and massage the olive oil over the leaves. Separate the leaves into the 4 bowls. Slice the avocado and split into the 4 bowls. Add the quinoa and roasted chickpeas/potatoes to the bowls and serve! I had only red quinoa (what an interesting color with the turmeric). I used smoked paprika for the beans. I wanted something I could freeze so I roasted cauliflower with olive oil, garlic powder and crushed red pepper instead of the kale. What a big yum-o. And I used sweet potatoes instead of regular. Great flavor combo. Yum, that sounds amazing! Love the roasted cauliflower idea. So yummy! I made this I used sweet potato instead but omg I never thought how tasty and filling this would be ! It’s my first time having a buddha bowl n trying quinoa as well. So yummy ! This looks delish! Recently I started obsessing about turmeric. It is so good for you! I love love love turmeric! Enjoy! I love chickpeas! A great way to get your protein in. I’ll have to get some turmeric and give this recipe a try. Thanks for sharing!